Jonathan Bowler’s research will lead to recommendations that could help agencies coordinate recreational management to improve the public’s recreational experiences along a stretch of the Green River from Flaming Gorge Dam to Lake Powell. University of Wyoming student Jonathan Bowler of Pittsburgh, Pa., is the recipient of the first John L. Kemmerer Jr. Graduate Fellowship, a new endowed award to recognize and support outstanding students in the UW Haub School of Environment and Natural Resources. The Kemmerer family, whose origins in the state date back to coal mining in the city of Kemmerer in the 1890s, endowed the fellowship, with matching funds from the state of Wyoming, to support interdisciplinary graduate studies in environment and natural resources fields. 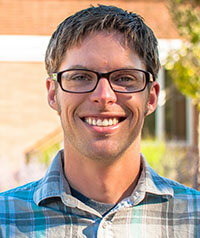 Bowler is pursuing triple Master of Science degrees in planning, water resources, and environment and natural resources. His research will analyze the administrative policies along a 456-mile-long uninterrupted stretch of the Green River from Flaming Gorge Dam to Lake Powell. Nicknamed the Powell Trip, in honor of John Wesley Powell’s 1869 expedition, this stretch is legendary among boaters. It winds through red desert sandstone, linking up one of the longest continuous river trips in the United States. Despite the allure it has for river runners, few people experience the full journey. The river permits are difficult for boaters to piece together due to inconsistent policies from the five different agencies managing the river. Bowler’s research will lead to recommendations that could help these agencies coordinate recreational management to improve the public’s recreational experience. The Kemmerer Fellowship supports Bowler’s interdisciplinary research. The Kemmerers created the fellowship to help particularly ambitious students pursue meaningful graduate research. The family hopes the fellowship will lead to improved understanding and management of natural resources, including recreation and tourism, in the West. Bowler’s thesis project is titled “Place Dependence and the Recreation Opportunity Spectrum: Moving Towards Collaborative Interagency River Recreation Management on the Green River in Utah.” His research integrates a review of administrative policies for recreation permits and an analysis of resource management plans along the river. He will gather information by conducting a GIS map analysis of land ownership and management infrastructure; surveying recreational boaters about current use of the river and interest in future use; and calculating carrying capacity for the Uintah Basin stretch of the river following the U.S. Forest Service’s Recreation Opportunity Spectrum. The project is timely, Bowler says, because of the increasing public interest in floating the river and because upcoming Resource Management Plan revision processes along the river will open the door for updating recreation management policies. Through interdisciplinary problem solving, the UW Haub School of Environment and Natural Resources gives students the skills and tools to build sound, innovative, lasting solutions to complex environmental and natural resource challenges. For more information, contact Emilene Ostlind, Haub School communications coordinator, at emilene@uwyo.edu or (307) 766-2604.